A Rinkya Blog: Coming of Age Day 2008! 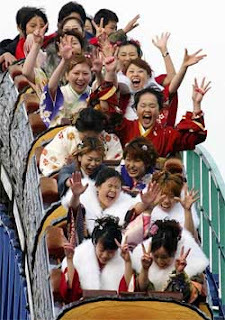 Yesterday in Japan, thousands of 20 year olds celebrated Coming Of Age Day (Seijin no hi). 20 is the age of "adulthood" in Japan and is the age in which they can legally drink, smoke and vote. Many celebrations take place across Japan during this National Holiday and many young people dress in traditional kimonos. Japan has one of the world's oldest population and very low birth rate, the number of people who reached adulthood was the lowest on record at 1.35 million.